Why put a fence around your garden? For a few reasons. A sturdy fence keeps critters, such as deer and rabbits, away from your vegetables and flowers. A fence can also play a decorative role, helping to set your garden off from other areas of the yard. Whether you're looking to spruce up your outdoor space or are getting tired of sharing your harvest with pests, check out these garden fence ideas for some inspiration. If you're going for a classic garden look, you really can't go wrong with a picket fence. The one pictured above surrounds a larger garden and has welcoming double doors that open onto a stone path. Your own fence can be much simpler. It can surround a small vegetable patch in the backyard or be an elegant backdrop for a rose garden. If pest control is your main concern, keep in mind that a picket fence might not be enough to keep opportunistic animals out of the garden. But if you're more concerned with looks than function, it can be a good choice. Sometimes, the fence can become part of the garden itself. A tall fence made out of a trellis provides space for vining plants to grow. To keep the fence looking lush and green all year, choose an evergreen plant for it, such as English Ivy. If you don't mind the trellis looking a bit bare in the winter, you can choose to plant perennials or annuals that die back in the winter. Vining plants such as morning glory will easily cover a trellis in the spring and summer and will produce pretty flowers. But they'll be gone for the season onces the frost hits. Pallets, is there really anything they can't do in the garden? Collecting a number of wooden shipping pallets allows you to make an inexpensive garden fence. Many stores regularly have a collection of pallets and might be willing to give them to you if you ask nicely. How much you dress up the pallet fence is really up to you. You'll get more years of use out the fence if you stain or finish the wood with a water resistant product. You can also dress up your fence by attaching brightly colored pots to a few of the slats on the pallets, as shown above. Woven, or wattle, fencing is an old-school way of protecting your plants for intruders and pests. All you need to make a wattle fence is a collection of sticks, some time and a bit of patience. Originating from the English countryside, wattle fencing and trellises were traditionally made using branches of hazel or willow wood, according to Mother Earth News. Hazel and willow tend to be flexible and easy to bend and shape. Don't worry if you don't have any willow or hazel trees growing nearby, though. Any type of wood will do, as long as you harvest the branches when they are still green. Looks aren't everything when it comes to garden fences. Sometimes, you need a fence that is more practical than it is pretty. The video from Garden Wisdom walks you through the steps of making a garden enclosure to keep bunnies and other small, four-legged pests of your garden. In the video, Dave Epstein swaps out his garden's old, worn out fence for one made out of vinyl coated chicken wire and metal posts. Metal posts have a longer shelf life than wood, so he won't have to replace them as often. For further protection against rabbits, he secures the chicken wire to the soil using large ground staples. If you're looking for a sturdy fence that also looks good, try building one using wooden posts and a lot of smooth rocks or stone. Known as a gabion wall or fence, the structure is essentially a cage filled with rocks. Originally, gabion walls were used as military fortifications or as structures to support and maintain river banks. Today, they're often used in hardscaping, as either fences or retaining walls. Building a rock-filled fence yourself can take a bit of work (and a lot of rocks). But you'll also have full control over the size of the finished fence and over the way it looks. Your fence doesn't have to be made from inanimate materials. In some instances, plants can make the perfect living fence. There are several benefits to using plants as fencing. They can be strong enough to protect the garden from strong winds, for example. Since some plants attract certain wildlife and beneficial insects, a living fence can ultimately bring ecological balance to your garden, according to Mother Earth News. Finally, a living fence can be an extension of your garden, allowing you to grow shrubs, trees or even catci (depending on where you live). Sometimes, the simplest of fences can be the most appealing. If animal pests aren't too much of a concern, you can use branches and sticks to create a rustic garden, no weaving or wattling required. You might need to scrounge around a lot to find thick branches to serve as the corner posts for your fence. 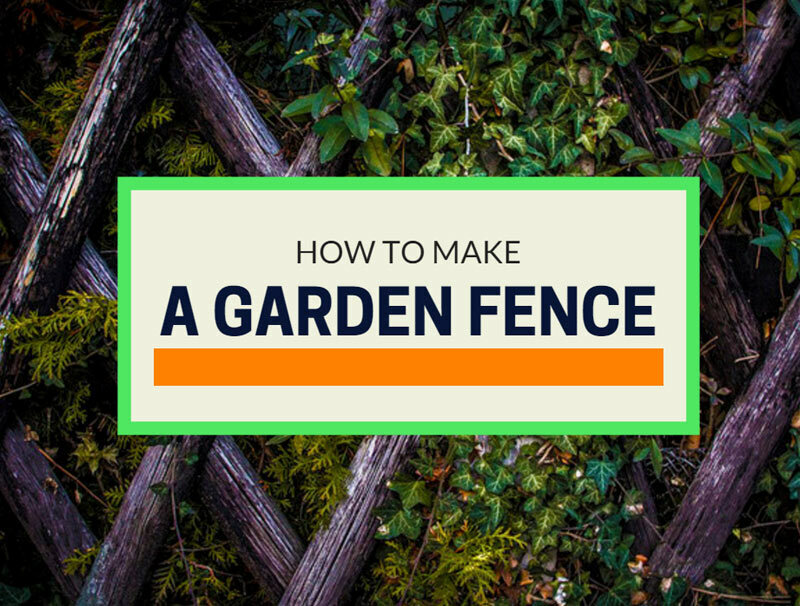 No matter what, you'll need a fair amount of branches and wood to put together the fence. An easy way to secure the branches to each other is to use quick ties. If you can't find quick ties, a piece of string can be the next best thing. This is definitely a fence that values form over function. It gives your space a rustic look but won't be super effective when it comes to keeping rabbits out.